AvL's Model 1878 Vehicle-Mount / DriveAway Mobile VSAT antenna features an offset 1.8m reflector and the patent-pending AvL Cable Drive positioner for reliability and ease of operation. The Model 1878K mobile broadband antenna system is a motorized, palletized antenna with a Fixed Ku-Band Precision feed or a Fixed C-Band feed. 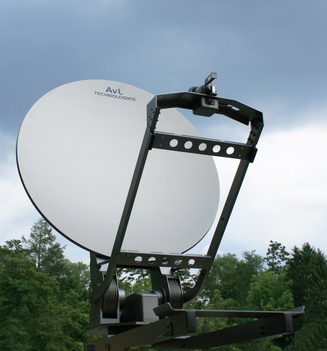 The Model 1878 provides connectivity in remote environments worldwide where larger aperture antennas are desired to combat rain-fade and weaker satellite signals.